I'm not kidding when I say Anki might be the most powerful learning tool you use for learning Spanish. No matter what method you use to learn Spanish you will have to review and remember what you learn, and Anki is the best way I know to do that. It's also free, which helps. According to Wikipedia "Anki" comes from the Japanese word for memorization. It is an automated flashcard program that uses spaced recognition to help you memorize information, especially words. Remember those paper 3 by 5 cards you used to make in school to review stuff for a test? Well Anki is that and more, only on your phone or computer. You can write the cards yourself or download shared decks that other people have made. You keep the cards in decks which you can sort in any manner you choose i.e. you can make a verbs deck and a adjectives deck, or a deck for words you learned in a lesson and another for the ones you learned on Netflix. The deck will then give you a certain number of new cards per day, which you set. Intermixed with your daily new cards your deck will also show you old cards from previous days. Each card will show you a piece of information on the front and, just like a paper flashcard, after you think of a response you "flip" the card over to reveal the correct answer on the back. Then comes the powerful part, the back of the card will ask you how hard the question was, your answer will determine when the card shows up again. This spaced repetition ensures that you are shown a card right before you forget it, allowing to memorize more efficiently. The back of a flashcard. Notice how the answers determine when the card will be shown again. Anki can help you memorize pretty much anything you need to remember while learning Spanish. You can add sound clips as well as pictures to help reinforce your vocabulary, grammar, or pronunciation. I've even see a deck that required you to spell out the answer out letter by letter. There are also a lot of shared Spanish Anki decks you can download that are already made. The best part is some of them are made to go accompany other Spanish tools like the FSI courses or Duolingo. Gabriel Wyner, the author of the book Fluent Forever (which I highly recommend), made a great tutorial on how to download Anki and get started making your own cards. Coffee drinker, Spanish speaker, habitual traveler, taking life one beautiful day at a time. Copyright text 2016 by Spanish Hackers. 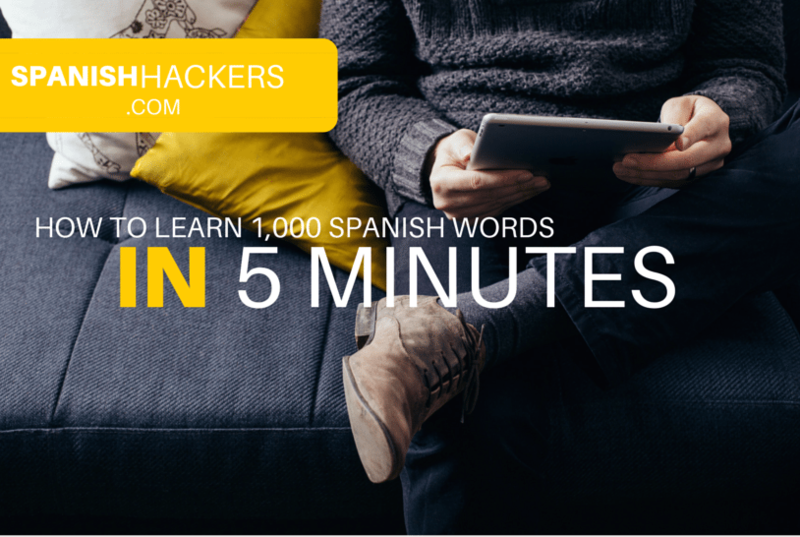 Get Free Access to Our Spanish Hacking Guide! Learn 10 easy grammar rules that will help you learn 1,000 words almost instantly!